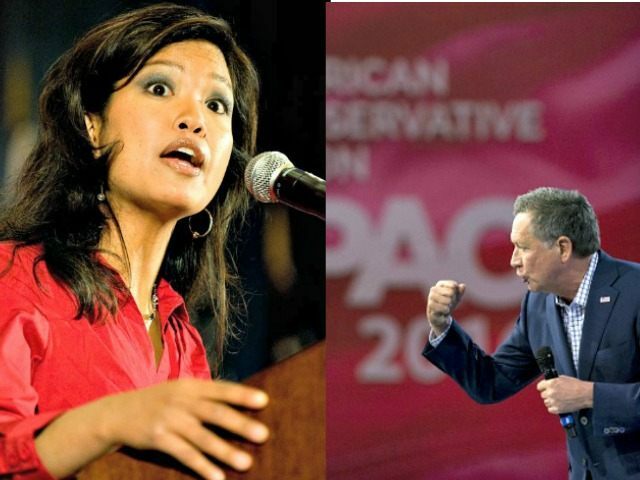 Best-selling conservative author and senior editor for the Conservative Review Michelle Malkin slammed Ohio Gov. John Kasich’s support for Common Core standards, drawing loud boos from attendees at the Conservative Political Action Conference (CPAC) Friday directed at the governor. “My job is not to tell people what they want to hear but what they need to hear,” a fired-up Malkin declared. “We just had Governor John Kasich — a nice guy by all means — who last night during the debate pretended he was on the side of local control. People talk about the Establishment without naming names. I do that. You want to talk about the names of the front groups in D.C. that are cashing in and selling out American parents and taxpayers on things like Common Core? It’s the National Governors’ Association for Common Core. They were in the backrooms hiring Clinton-era education ideologues. Radicals who do not believe in the constitutional principle of local control of education and the sovereignty of our families. Malkin attacked Kasich immediately after he delivered his CPAC address on the main stage.